I know this is a repeat, but it bears repeating as these are a little gem in my Mom It Down series and I just keep coming back to them. Why? Let’s see: they’re super healthy. They’re made made without sugar. 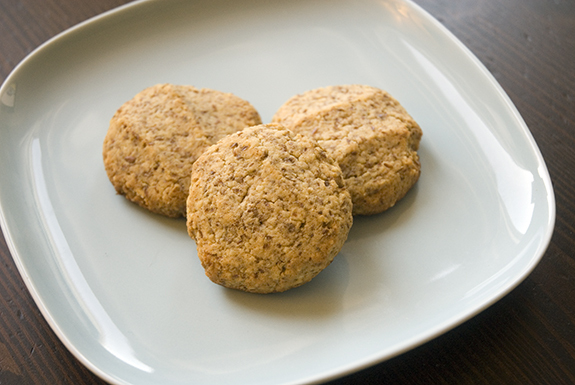 They’re gluten-free and they’re full of flax seed and protein. Oh! And they taste great! You seriously can’t go wrong with these cookies. Just this morning Em asked me if he could have cookies for breakfast and I was all, “Sure you can have cookies for breakfast!” And behold, he had three cookies for breakfast paired with a glass of milk. Awesome, right? My extremely picky child even likes these. He and his father eat them up like they’re treats. And I suppose they are! But they’re super healthy treats! AND I JUST CAN’T WRITE THAT ENOUGH, PEOPLE! You should make these for your family. Take your unsalted butter out of the refrigerator a while before starting. It should be room temperature—super soft. I usually put mine directly into the mixer. Add honey, vanilla, and egg. Stir that up until it’s creamy. It might be a little lumpy. That’s OK. Once you add the dry ingredients, the batter will smooth out. 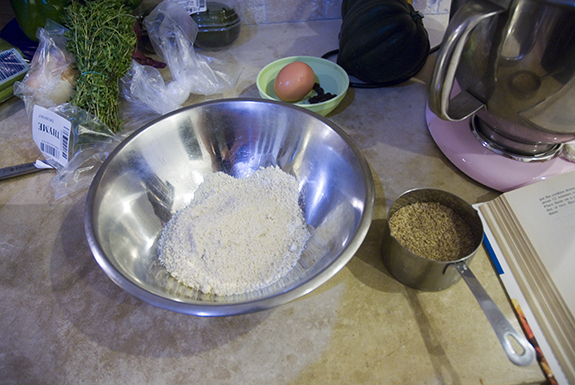 In a separate bowl, or directly into a two-cup measuring cup, add all the dry ingredients. Add that to your mixer. 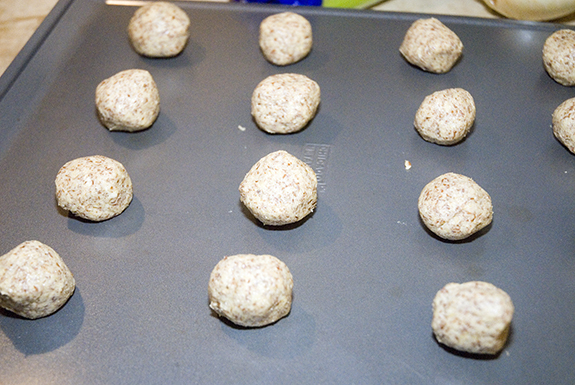 Spoon walnut-sized balls onto a cookie sheet. 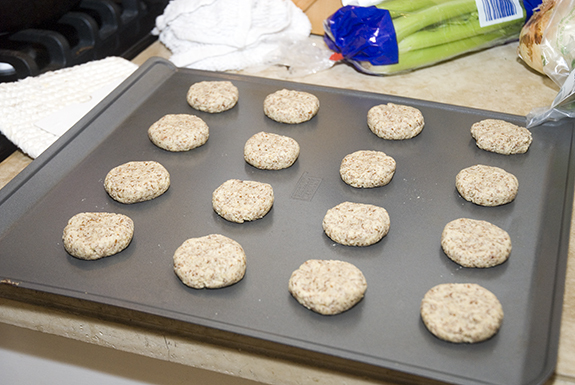 Flatten each one down usig your fingers, a spoon, or a spatula until they are about half their height. If the dough is too sticky, you can refrigerate it for 15-30 minutes. If you’re in a hurry, add a little bit more soy protein powder. I wish to change the original even more. I might glaze the tops with maple syrup or honey before baking. Also, I think serving these alongside some jam or preserves would outstanding—specifically, strawberry or raspberry. YUM! I’ve used Booker’s bourbon instead of vanilla and it works perfectly. P.S. Sorry I haven’t updated in, oh, like forever. We were in Disney last week and I’ve got some stuffs going on. I hope to write more now that things have settled down a bit. I want to make these! almond meal and flaxseed meal is that just ground almonds/flaxseed? is soya the same as soy? might sound like stupid questsions .. sorry. can i substitute agave nectar for honey? I’m not sure about soya. You mean in place of the soy protein powder? Don’t quote me on this, but I have heard that grinding almonds might not give you the same consistency as buying almond flour. Again, don’t quote me on that, but the fat content might be too high? You can try, but it may not turn out. And I’m not sure about grinding the flaxseed yourself either. I know that our whole flax seeds have pretty heavy duty shells and I can’t imagine you’d want that in your meal. BUT! Again, I am not the expert here. :] So, if you DO try, let me know if it works! I’ve just found agave and like it so much better than honey (never been a big fan). Living in another country where things are different is hard when you want to bake/cook something with unusual ingredients. Soon as I get the ingredients sorted, I’m totally making these. My kids always want cookies for breakfast! yes, soy is soya over here. if you’re in london, there’s Wholefoods in kensington. there’s a website called ‘urban path’ and they list health food shops. i don’t know if they’re only london based though. WOW…I cant wait to try these, is there anyting that I can substitiute for the butter? These will be great to have after my run, loads of protein which helps after 20kms. I dont use butter at all in anything so am open to anything you can suggest. Hmmm, do you use oil of any type? Do you use vegan margarine? Either might work. I would opt for the vegan margarine before the oil. :] they are amazing. just wanted to let you know i made a HUGE batch of these saturday. we tried numerous variations for toppings including jam, honey glazes and brown sugar. jack loves them and also really enjoyed helping. we tripled the recipe and made about 90 cookies. left some with my folks, brought some in to work, etc. i really like how delicate they are and barely sweet. Just put this in the oven and it is smelling yummy already. Can’t wait to try it. Might try to use pumpkin spice or cinnamon next time. Do you think I should use it instead of vanilla or with it? Also, I could only find vanilla flavored (or chocolate flavor) soy powder. Did you use without flavour? 5 minutes till its done! What could I substitute the flaxseed meal with, do you think? Hmmm tough one. Maybe cornmeal? Hey! Can you let me know what works? I am curious! I will do that, as soon as the soy protein I ordered comes in and I bake stuff. I am hoping these cookies can replace all the damn snickers I ingest! Just made these and wow! They are a hit! Just what I was looking for. I actually used chocolate flavored soy protein powder and it gave them a light chocolate flavor. I also ground up my own almonds instead of buying the almond meal. YUM! katrina, just read yr feedback – roast flaxseed then blend to your liking. I usually blend mine to powder then use. Hope this helps!